From Cervenohorske sedlo (CHS), use the red trail to get to a place called Vresova studanka. Up to here there is a hard surfaced road, suitable even for cyclists. Then continue along the red trail to Sedlo below Vresova studanka. Besides the present route, we recommend you visit the mountain top of Cervena hora, where you can view rocks and a rock formation called Kamenne okno. Step from the red trail to the green trail and you reach the mountain top of Vozka via a place called Japonska zahradka, where you can find rocks providing a beautiful view. 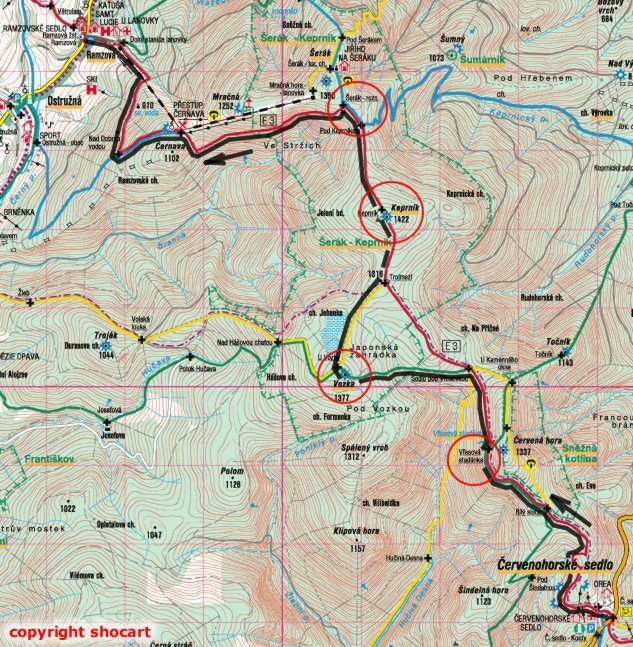 Join the yellow route and go down below the mountain top of Keprnik, where you will rejoin the red trail. This one takes you to Keprnik, where you can again admire rocks with a panoramic view of the countryside. Continue to the mountain peak of Serak, and maybe pause for some refreshments. Going down to Ramzova, you can either use the red trail via Cernava or go along the blue trail to the rocks of Obri skaly and continue along the green trail. Alternatively, you can take a chairlift from Serak as far as Ramzova. The route leads along pathways; there is also a hard surfaced road to Vresova studanka. This is a moderately difficult trail.